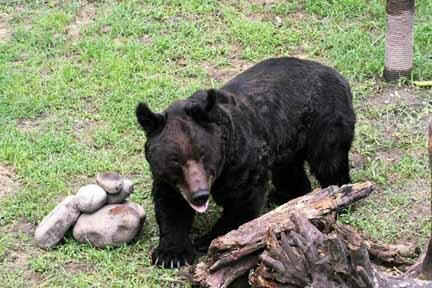 Right now, at least 12,000 bears are suffering on bear bile farms in Asia. They are held captive in tiny "crush cages" the size of their bodies in shocking conditions. Cubs grow into the bars as their bodies mature, immobilized in an iron corset - their life is a living hell. 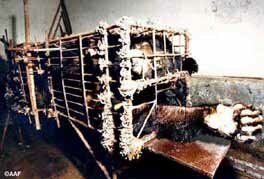 These bears are farmed needlessly for the bile contained in their gall bladders used in Traditional Asian Medicine. "It's a torture chamber, it's a hell hole for animals..."
There are at least 54 cruelty free alternatives to bear bile. Why is Become Known Involved? After learning about this horror, how can we not be? We are volunteering and using our PR skills to help spread the word to save these bears and end cruel bear farming and bear baiting forever. Why do we Include Images and Videos? To prevent them from struggling during the "milking" process, bears are totally constrained within wire cages, called "crush cages", the size of their bodies. Bears like Saskia, since rescued, are terrified as they spend up to a lifetime in barbaric cages like this where they can't move. Photo credit Animals Asia. Irwin was nicknamed "Hagrid". His huge body was crammed into an impossibly small cage. Just try to imagine this poor bear having to live his entire life crammed into a cage smaller than his body. Irwin had a malignant, invasive inoperable and painful tumour, so he was euthanised before his condition could worsen. Photo courtesy Animals Asia. .
"Freeing China's caged bile bears"
Jill Robinson's life was forever changed when she stole away from her tour group on a Chinese bear bile farm and descended a flight of stairs to a dark basement, where she saw the dim outlines of cages. 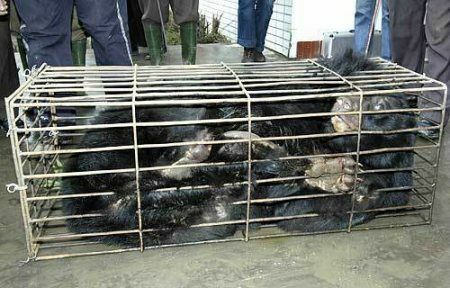 Read the entire article "Freeing China's caged bile bears". Warning! Some videos below contain disturbing graphic images and sounds of bears in distress. 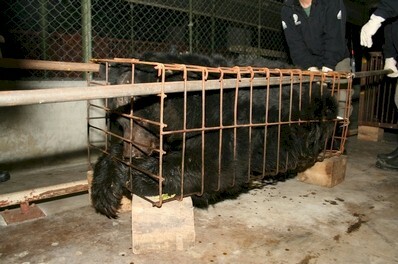 Animals Asia Moon Bear Rescue. Interview with Jill Robinson, Founder of Animals Asia. Heartwarming story about the rescue of Snoopy, the Moon Bear. With Jill Robinson, Founder of Animals Asia. The Moon Bear Story. With Jill Robinson, Founder of Animals Asia. Olver is a beautiful brown bear who Animals Asia recently rescued along with nine other bears from a bear farm in China. Photo credit: Animals Asia Facebook page. When Animals Asia rescued Oliver, he way laying on his back and bore indentations of a hedious barbaric full metal jacket around his torso. Oliver suffered unimaginable horror for 30 years caged on two bear farms in a cage too small for his body. Please help bears like Oliver and support Animals Asia China Bear Rescue. Bear baiting is possibly the world's most savage blood sport.Teeth and claws removed, bears are tied to a post and set-upon by trained fighting dogs. All in the name of entertainment. Warning! The videos below contain disturbing graphic images and sounds of bears in distress. "You are either an activist or an inactivist. So do something important this week, watch this movie and then look in the mirror and ask yourself - which one am I? And if you are so inclined, take action." To paraphrase Director Louie Psihoyos, in the film The Cove. "The greatness of a nation and its moral progress can be judged by the ways its animals are treated." Thank You For Helping these Bears!